CLEVELAND (AP) After the Cavaliers’ fourth loss in five games, LeBron James is turning to the calendar for comfort. ”What month is this for me? October? I’m not about to go crazy over it right now. It’s too long of a season. I’ve been a part of this way too many times,” James said after Sunday night’s 114-95 loss to the New York Knicks. Tim Hardaway Jr. scored 34 points, Kristaps Porzingis had 32 and the Knicks won for the second time after losing their first three games. Cleveland, which was blown out by Orlando at home and lost to Brooklyn during this stretch, fell below .500. The Cavaliers were routed 123-101 in New Orleans on Saturday. ”Tonight’s loss and the last couple are unacceptable,” coach Tyronn Lue said. The Cavaliers are favorites to return to the NBA Finals for the fourth straight season, but their issues continued, particularly on the defensive end. ”We could have folded against a veteran team like that, but we made some big shots and pulled it out,” New York coach Jeff Hornacek said. New York beat Cleveland for the first time since Oct. 30, 2014 – James’ first game back with the Cavaliers after playing four seasons in Miami – a span that covered 10 games. New York took over in the third quarter and built the lead to 17 on several occasions in the period. Sunday marked the anniversary of James’ professional debut in 2003 against Sacramento. He had 25 points with nine assists and six rebounds. ”I played better 14 years ago than I did tonight,” James said. Hardaway fell two points of his career high, which came on March 3 of last season against the Cavaliers while he played for Atlanta. 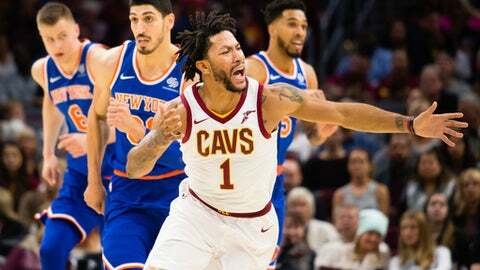 Rose’s return meant Lue went with his fifth different starting lineup in the first seven games. Cavaliers guard Iman Shumpert didn’t play because of a sore right knee. He had spent time at point guard with Rose sidelined and started Saturday. Knicks: Porzingis had 12 rebounds while Enes Kanter had 18 points and 12 rebounds. … Lee scored 15 points and had 10 rebounds. … Jack and G Ramon Sessions each spent one full season with Cleveland. Cavaliers: Cleveland’s loss to Orlando snapped a 17-game winning streak against the Magic. … Power forward Tristan Thompson had one point, no rebounds and four fouls in 19 minutes. … Love hit two 3-pointers in the first six minutes, giving him 900 for his career. Knicks: Return home to play Denver on Monday night in their first back-to-back set of the season. Cavaliers: Host Indiana on Wednesday night. Cleveland has won seven straight in the series at home.